Prior to MySQL 5.7 client communications with a MySQL instance were unencrypted by default. This plaintext capability allowed for various tools including pt-query-digest to analyze TCP/IP traffic. Starting with MySQL 5.7 SSL is enabled by default and will be used in client communications if SSL is detected on the server. We can detect and confirm this easily with the ngrep command. On a MySQL 5.6 server we monitor the default MySQL port traffic. We connect to this server using TCP/IP. We can observe the communication to and from the server (in this example 192.168.42.16) is plaintext. A default 5.6 installation does not have SSL enabled as verified by system variables. Running the same example client connection with MySQL 5.7 you will observe that communications to and from the server (in this example 192.168.42.17) are not in plaintext. A new MySQL 5.7 installation will have SSL enabled by default as seen in the MySQL variables. If you want to emulate the unencrypted nature of MySQL 5.6 within any SSL enabled MySQL version (e.g. MySQL 5.7) you specify the --ssl option for mysql client connections. In MySQL 5.7 this option is also deprecated and --ssl-mode=disabled should be used>. Implementing MySQL Security Features - Tutorial at Percona Live Europe 2017. Giuseppe Maxia has provided some great MySQL docker images. Percona and MariaDB also provide version via Docker Hub. In an attempt to have a consistent means of launching these different images I created the following convenience functions. Install docker for your OS. See Official Docker installation instructions. Run your desired variant and version. I was recently asked this question by an experienced academic at the NY Oracle Users Group event I presented at. This is contrary to the first Google response found searching this question which for reference states “The standard table handler for MySQL is not ACID compliant because it doesn’t support consistency, isolation, or durability”. The question is however not a simple Yes/No because it depends on timing within the MySQL product’s lifecycle and the version/configuration used in deployment. What is also *painfully* necessary is to understand why this question would even be asked of the most popular open source relational database. MySQL has a unique characteristic of supporting multiple storage engines. These engines enabling varying ways of storing and retrieving data via the SQL interface in MySQL and have varying features for supporting transactions, locking, index strategies, compression etc. The problem is that the default storage engine from version 3.23 (1999) to 5.1 (2010) was MyISAM, a non-transactional engine, and hence the first point of confusion. The InnoDB storage engine has been included and supported from MySQL 3.23. This is a transactional engine supporting ACID properties. However, not all of the default settings in the various MySQL versions have fully meet all ACID needs, specifically the durability of data. This is the second point of confusion. Overtime other transactional storage engines in MySQL have come and gone. InnoDB has been there since the start so there is no excuse to not write applications to fully support transactions. The custodianship of Oracle Corporation starting in 2010 quickly corrected this *flaw* by ensuring the default storage engine in MySQL 5.5 is InnoDB. But the damage to the ecosystem that uses MySQL, that is many thousands of open source projects, and the resources that work with MySQL has been done. Recently working on a MySQL 5.5 production system in 2016, the default engine was specifically defined in the configuration defined as MyISAM, and some (but not all tables) were defined using MyISAM. This is a further conversation as to why, is this a upgrade problem? Are there legacy dependencies with applications? Are the decision makers and developers simply not aware of the configuration? Or, are developers simply not comfortable with transactions? Like other anti-reasonable MySQL defaults the unaware administrator or developer could consider MySQL as supporting ACID properties, however until detailed testing with concurrency and error conditions not realize the impact of poor configuration settings. The damage of having a non-transactional storage engine as the default for over a decade has created a generation of professionals and applications that abuses one of the primary usages of a relational database, that is a transaction, i.e. to product a unit for work that is all or nothing. Popular open source projects such as WordPress, Drupal and hundreds more have for a long time not supported transactions or used InnoDB. Mediawiki was at least one popular open source project that was proactive towards InnoDB and transaction usage. The millions of plugins, products and startups that build on these technologies have the same flaws. Further confusion arises when an application uses InnoDB tables but does not use transactions, or the application abuses transactions, for example 3 different transactions that should really be 1. While newer versions of MySQL 5.6 and 5.7 improve default configurations, until these versions a more commonly implemented non-transactional use in a relational database will remain. A recent Effective MySQL NYC Meetup survey showed that installations of version 5.0 still exist, and that few have a policy for a regular upgrade cadence. Trove is used for self service provisioning and lifecycle management for relational and non-relational databases in an OpenStack cloud. Trove provides a RESTful API interface that is same regardless of the type of database. CLI tools and a web UI via Horizon are also provided wrapping Trove API requests. In simple terms. You are a MySQL shop. You run a replication environment with daily backups and failover capabilities which you test and verify regularly. You have defined DBA and user credentials ACL’s across dev, test and prod environments. Now there is a request for using MongoDB or Cassandra, the engineering department has not decided but they want to evaluate the capabilities. How long as a operator does it take to acquire the software, install, configure, setup replication, backups, ACLs and enable the engineering department to evaluate the products? With Trove DBaaS this complexity is eliminated due to a consistent interface to perform the provisioning, configuration, HA, B&R, ACL across other products the exact same way you perform these tasks for MySQL. This enables operations to be very proactive to changing technology requests supporting digital transformation strategies. Enabling this capability is not an automatic approval of a new technology stack. It is important that strategic planning, support and management is included in the business strategy to understanding the DBaaS capability for your organization. Examples of operations due diligence would include how to integrate these products into your monitoring, logging and alerting systems. Determine what additional disk storage requirements may be needed. Test, verify and time recovery strategies. Trove specifically leverages several other OpenStack services for source image and instance management. Each trove guest image includes a base operating system, the applicable database software and a database technology specific trove guest agent. This agent is the intelligence that knows the specific syntax and version needs to perform the tasks. The agent is also the communication mechanism between Trove and the running nova instance. Trove is a total solution manager for the instance running your chosen database. Instances have no ssh, telnet or other general access. The only access is via the SQL communication via the defined ports, e.g. 3306 for MySQL. The Trove lifecycle management covers the provisioning, management, security, configuration and tuning of your database. Amrith Kumar in a recent presentation at the NYC Postgres meetup provides a good description of the specifics. Trove is capable of describing and supporting clustering and replication topologies for the various data stores. It can support backup and restore, failover and resizing of clusters without the operator needing to know the specific syntax of complexities of a database product they are unfamiliar with. A great example is the subtle difference in MySQL replication management using GTID’s between MySQL and MariaDb. To the developer, the interaction between MySQL and MariaDB via SQL is the same, the management of a replication topology is not identical, but is managed by the Trove guest agent. To the operator, the management is the same. Also in his presentation, Kumar described Tesora, an enterprise class Trove service provided with a number of important additional features. Tesora supports additional database products including Oracle and DB2Express as well as commercial versions for Oracle MySQL, EnterpriseDB, Couchbase, Datastax, and mongoDB. Using the Horizon UI customizations with pre-defined trove instances greatly reduces the work needed for operators and deployers to build there own. The following presentation was given at the Oracle Technology Network (OTN) Latin America 2015 tour events in Uruguay, Argentina, Chile and Peru. This past week I have been the sole MySQL representative on the Oracle Technology Network (OTN) Latin America 2015 tour events in Uruguay, Argentina, Chile and Peru. The Ubuntu 12.04.3 LTS release only provides MySQL 5.1 and MySQL 5.5 using the default Ubuntu package manager. Oracle (owners of the MySQL(tm)) now provide Debian/Ubuntu APT repositories for all GA and DMR versions of MySQL including supporting Ubuntu 12.04. The following steps demonstrate upgrading from the Ubuntu 5.5 server package to the Oracle 5.6 server package. Results may vary based on dependencies. 150402 16:02:49 [Note] Plugin 'FEDERATED' is disabled. 150402 16:02:49 InnoDB: highest supported file format is Barracuda. 150402 16:02:50 [Note] Server socket created on IP: '127.0.0.1'. 150402 16:02:50 [Note] /usr/sbin/mysqld: ready for connections. A check shows that this is not the most current version available of 5.5 using the Ubuntu packages. Just to be consistent with keeping current versions, you may choose to update MySQL 5.5 to the current available version. This unfortunately uses a cursors based interface which is not something you automate for production systems and not the approach I would suggest. Now we can look at available versions. This is where life gets a little confusing. Because Ubuntu supported MySQL 5.1 (as mysql-server) and MySQL 5.5 (as mysql-server-5.5) it can be misleading. package available in the repository. We are looking to ensure the Maintainer is the Official Release. 2015-04-02 16:53:07 0 [Warning] Using unique option prefix key_buffer instead of key_buffer_size is deprecated and will be removed in a future release. Please use the full name instead. 2015-04-02 16:53:07 0 [Warning] TIMESTAMP with implicit DEFAULT value is deprecated. Please use --explicit_defaults_for_timestamp server option (see documentation for more details). You may think the process is completed, but it is not. Always, Always check the error log. Have you checked your MySQL error log today? 2015-04-02 16:53:14 20429 [Warning] Using unique option prefix myisam-recover instead of myisam-recover-options is deprecated and will be removed in a future release. Please use the full name instead. 2015-04-02 16:53:14 20429 [Note] Plugin 'FEDERATED' is disabled. 2015-04-02 16:53:15 20429 [Note] InnoDB: Highest supported file format is Barracuda. 2015-04-02 16:53:15 20429 [Note] InnoDB: 128 rollback segment(s) are active. 2015-04-02 16:53:15 20429 [Warning] No existing UUID has been found, so we assume that this is the first time that this server has been started. Generating a new UUID: 487fda28-d97a-11e4-9254-e0cb4e3feb73. 2015-04-02 16:53:15 20429 [Note] Server socket created on IP: '127.0.0.1'. 2015-04-02 16:53:15 20429 [ERROR] Column count of mysql.events_waits_current is wrong. Expected 19, found 16. Created with MySQL 50541, now running 50623. Please use mysql_upgrade to fix this error. 2015-04-02 16:53:15 20429 [ERROR] Column count of mysql.events_waits_history is wrong. Expected 19, found 16. Created with MySQL 50541, now running 50623. Please use mysql_upgrade to fix this error. 2015-04-02 16:53:15 20429 [ERROR] Column count of mysql.events_waits_history_long is wrong. Expected 19, found 16. Created with MySQL 50541, now running 50623. Please use mysql_upgrade to fix this error. 2015-04-02 16:53:15 20429 [ERROR] Incorrect definition of table performance_schema.events_waits_summary_by_thread_by_event_name: expected column 'THREAD_ID' at position 0 to have type bigint(20), found type int(11). 2015-04-02 16:53:15 20429 [ERROR] Column count of mysql.file_summary_by_event_name is wrong. Expected 23, found 5. Created with MySQL 50541, now running 50623. Please use mysql_upgrade to fix this error. 2015-04-02 16:53:15 20429 [ERROR] Column count of mysql.file_summary_by_instance is wrong. Expected 25, found 6. Created with MySQL 50541, now running 50623. Please use mysql_upgrade to fix this error. 2015-04-02 16:53:15 20429 [ERROR] Incorrect definition of table performance_schema.mutex_instances: expected column 'LOCKED_BY_THREAD_ID' at position 2 to have type bigint(20), found type int(11). 2015-04-02 16:53:15 20429 [ERROR] Incorrect definition of table performance_schema.rwlock_instances: expected column 'WRITE_LOCKED_BY_THREAD_ID' at position 2 to have type bigint(20), found type int(11). 2015-04-02 16:53:15 20429 [ERROR] Column count of mysql.threads is wrong. Expected 14, found 3. Created with MySQL 50541, now running 50623. Please use mysql_upgrade to fix this error. A MySQL upgrade of the meta schema is necessary. 150402 17:06:17 mysqld_safe Can't log to error log and syslog at the same time. Remove all --log-error configuration options for --syslog to take effect. 2015-04-02 17:06:17 0 [Warning] Using unique option prefix key_buffer instead of key_buffer_size is deprecated and will be removed in a future release. Please use the full name instead. 2015-04-02 17:06:17 0 [Warning] TIMESTAMP with implicit DEFAULT value is deprecated. Please use --explicit_defaults_for_timestamp server option (see documentation for more details). 2015-04-02 17:06:17 20994 [Warning] Using unique option prefix myisam-recover instead of myisam-recover-options is deprecated and will be removed in a future release. Please use the full name instead. 2015-04-02 17:06:17 20994 [Note] Plugin 'FEDERATED' is disabled. 2015-04-02 17:06:17 20994 [Note] InnoDB: Highest supported file format is Barracuda. 2015-04-02 17:06:17 20994 [Note] InnoDB: 128 rollback segment(s) are active. 2015-04-02 17:06:17 20994 [Note] Server socket created on IP: '127.0.0.1'. 2015-04-02 17:06:17 20994 [Note] /usr/sbin/mysqld: ready for connections. As you can see there are several warnings/errors when starting MySQL. mysqld_safe Can't log to error log and syslog at the same time. Remove all --log-error configuration options for --syslog to take effect. 2015-04-02 17:18:06 22123 [Warning] Using unique option prefix myisam-recover instead of myisam-recover-options is deprecated and will be removed in a future release. Please use the full name instead. The warnings are interesting, and will part of the following post on MySQL 5.6 configuration changes discussed in the next point. As part of a MySQL 5.5 to MySQL 5.6 upgrade across several Ubuntu servers of varying distros an audit highlighted a trivial but interesting versioning identification error in Ubuntu’s packaging of MySQL. $ mysql -uroot -p -e "SELECT VERSION()"
But when you look at the mysql --version it does NOT say 5.5.41. On 14.04 I get expected results. rbradfor@rubble:~$ mysql -uroot -p -e "SELECT VERSION()"
Before MySQL 5.6 it was necessary to stop MySQL and remove the InnoDB log files manually before restarting MySQL. 2015-03-28 21:51:25 3767 [Warning] InnoDB: Starting to delete and rewrite log files. It was however odd that MySQL had indicated it had successfully started but the underlying Redo log files were not complete and in-place as seen by the following directory listings. If you run multiple MySQL environments on multiple servers it’s a good habit to set your MySQL prompt to double check which server you are on. however, using the MYSQL_PS1 environment variable I found this does not work under sudo (the normal way people run sudo). I.e., the following syntax’s work. but the following does not. The trick is actually to ensure via /etc/sudoers you inherit the MySQL_PS1 environment variable. I recently came across an issue trying to connect to a MySQL server using the mysql client. It appeared as through the connection was hanging. A subsequent connection using the -A option highlighted the problem with the previous connection stuck in the state “Waiting for table metadata lock”. Info: create table missing as select id from AK where id not in (select id .. In this example you can see a long running CREATE TABLE … SELECT statement as the cause of the problem. The -A or –no-auto-rehash argument is a means of disabling the tab completion in the mysql command line client. Next week the US celebrates Thanksgiving Day. For those that are American or live here, this is a significant event. Three different experiences recently have lead me to write this request for ALL MySQL community members to give thanks to those that have contributed to the MySQL ecosystem. I have made a commitment to myself, and I would like to challenge others to write one book review per week in December, that’s 4 book reviews to the MySQL books that I have on my bookshelf that have made an impact in some way. I ask others to give it a go too. It only takes a few minutes to pen a comment on Amazon, or a publishers site, but to authors it means so much more. I can only speak for myself, but any comment; good, bad or ugly; helps to know you are out there and you took the time to acknowledge somebody’s work of art (in this case a publication). I only have to look at my bookshelf and I find the following MySQL books (in order they currently are placed which is no specific order), MySQL Crash Course by Ben Forta, MySQL Clustering by Alex Davies and Harrison Fisk, MySQL Cookbook by Paul DuBois, MySQL Stored Procedure Programming by Guy Harrison, Developing Web Applications with Apache, MySQL, memcached, and Perl by Patrick Galbraith, Pro MySQL (The Expert’s Voice in Open Source) by Mike Kruckenberg and Jay Pipes, MySQL Administrator’s Bible by Sheeri Cabral, MySQL (Third Edition) by Paul DuBois, High Performance MySQL: Optimization, Backups, Replication, and More (Second Edition) by Baron Schwartz, Peter Zaitsev, Vadim Tkachenko, Jeremy Zawodny, Arjen Lentz and Derek Balling, High Performance MySQL: Optimization, Backups, and Replication (Third Edition) by Baron Schwartz, Peter Zaitsev, Vadim Tkachenkoo, MySQL High Availability: Tools for Building Robust Data Centers by Charles Bell, Mats Kindal and Lars Thalman, Expert PHP and MySQL by Andrew Curiso, Ronald Bradford and Patrick Galbraith, Effective MySQL Backup and Recovery (Oracle Press) by Ronald Bradford, Effective MySQL Replication Techniques in Depth by Ronald Bradford and Chris Schneider, Effective MySQL Optimizing SQL Statements (Oracle Press) by Ronald Bradford, Database in Depth: Relational Theory for Practitioners by Chris Date, Pentaho Solutions: Business Intelligence and Data Warehousing with Pentaho and MySQL by Roland Bouman and Josh an Dongen, MySQL Administrator’s Guide and Language Reference (2nd Edition) and MySQL 5.0 Certification Study Guide by Paul Dubois, Stefan Hinz and Cartsten Pedersen. And they are just the physical books, I have several PDF and Kindle only versions, and other MySQL Books I know about and have not purchased. I would also like to give a special shout out to Sheeri Cabral and MySQL Marinate. A program using the O’Reilly Learning MySQL book to help anybody that wants to learn. At my most recent Effective MySQL Meetup a beginner question was asked by an audience member, and it was another audience member (not even myself) that piped up and recommended MySQL Marinate. Finally, I learned MySQL by reading the online reference manual from cover to cover, and I did it again several years later, and probably should do it again some day. I am unable to find the names of the authors present or past, nor the right place you could leave a comment, but thanks to those I do know about, Jon Stephens, Mike Hillyer, Stefan Hinz, MC Brown and Paul DuBois. Translating theory to practice is never easy. Morgan gives us the right steps in a play environment to move from dev.mysql.com native MySQL rpm’s to the new MySQL yum repository. I thought I would try it out. A necessary step, however immediately I have more dependencies including Perl DBD (used in several utilities) including MHA. A further trap in the more complex real-world environments, in my case the installation of Percona XtraBackup. This will become apparent in the next step. We need to check for these packages. There is a mixed blessing here. Assuming you keep your machines current (and you should), the impact here should be minimal, but buyer beware. In my case the update wanted to update java-1.7.0-openjdk. Should not be a big deal, but what other products are impacted by updates? Java on this system for example is used by the New Relic MySQL Monitoring. What if there was some important application component that may become unravelled with some update. Doing a blanket update on a reasonably current CentOS 6.4 system broke. The problem here is an unhealthy relationship between repositories for Percona Xtrabackup. I don’t know the reason, but this is the curse of dependencies that make real world upgrades more complex. Updating just MySQL is rather useless as it’s installed by rpm. Stopping MySQL is easy. Making a decision about, should I backup important files, like the config file, or the data should be considered here. The reality is for a production system, assume something unexpected will happen, even if you have tested it. Being able to go back in any step of an upgrade is actually more important than the step itself. So the following IS NOT ENOUGH in a production system. This old dinosaur learned a new trick in the yum interactive shell. Cool! Note, I am doing a point release upgrade here, from .13 to .14. Now the fun begins, you have to read carefully what is happening, check out the Removing for dependencies section. Also, you need to quit the yum shell. So, we have now installed MySQL via the new yum repositories, and we can verify this. $ mysql -e "SELECT VERSION()"
But, we now have a broken system, because dependencies were removed. Please explain this one to be batman, removing MySQL removed the sysstat package. Very weird. There is now a lot more work needed to check and recheck the dependencies and verify what did work previously still works. At this time doing this on 20 DB servers to move to the new yum repository is a fail for this client. It’s simply not worth it. Theory easy, practice not to easy! Recently a client asked me how long it would take for an ALTER TABLE to complete. Generally the answer is “it depends”. While this was running on a production system I tried with the Performance Schema in MySQL 5.6 to work out some answer to this question. While I never got to investigate various tests using INPLACE and COPY for comparison, Morgan Tocker made the request for experiences with online ALTER in A closer look at Online DDL in MySQL 5.6. Hopefully somebody with more time can expand on my preliminary observations. Using Mark Leith’s ps_helper (older version) I monitored the File I/O to see if I could determine when using innodb_file_per_table the percentage of table writing to be completed. Other data access on this slave server was disabled, so these results represent the I/O of a single ALTER TABLE statement. We can clearly see the reading of the Txxxxxxxxxxxxxx.ibd table,starting at 4.03G, then 7.79G, and following that a peak of 9.75 GB. This “Innodb Merge Temp File” also works in 1MB chunks, so comparing the “count” values between the base table of 16K operations can be misleading if you just look at count deltas during the process. Given more time, I would have performed more extensive monitoring including timestamps, and run a test using the COPY algorithm to see if this took less time. Working with MySQL 5.6 under CentOS 6.4 I came across the following problem with MySQL reporting it did not shutdown successfully. However, you have to look into the problem in the all important MySQL Error Log where I found a different story. 2013-11-04 14:43:40 32351 [Note] InnoDB: FTS optimize thread exiting. However, waiting it did indeed complete successfully. The announcement of the MySQL Yum repositories was a long overdue request on my wish list. While it was possible to find MySQL at http://public-yum.oracle.com/ it was not the GA version MySQL 5.6. (As I write this post, I check and find that indeed it now appears this may be possible http://public-yum.oracle.com/repo/OracleLinux/OL6/MySQL56/). I have previously installed MySQL 5.6.13 via rpms downloaded from MySQL Downloads, so I expected the upgrade to be straightforward. Following Chapter 3. Upgrading MySQL with the MySQL Yum Repository I had no success. Package(s) mysql-server available, but not installed. Looking at what information is available for the mysql-server package (This is the package name specified at Chapter 1. Installing MySQL on Linux Using the MySQL Yum Repository I find. This DOES NOT actually show what I would expect. I had to in fact search for mysql-community-server (NOTE: I discovered this as a note after the previously mentioned package name This installs the package for MySQL server (mysql-community-server) and also packages). I suspect I cannot update this (as it’s not actually installed), which is confirmed with. Package(s) mysql-community-server available, but not installed. So, I am left wit the option of installing this (again I’m not confident), and again confirmed. At this time I believe it’s not possible to update from official MySQL rpms to the official yum repository, which is rather disappointing. I would have assumed this was a test case. Hopefully, somebody with better package management skills can shed some light! The following steps were used to Install the MySQL repository. A trap for those new to the MySQL Performance Schema is the expectation that thread_id in tables such as events_statements_current matches the id you find in the MySQL processlist. This is NOT TRUE. However, if I wanted to look at the two slave threads in performance_schema.events_statements_current I will find no matching data. In the performance schema, you need to use the threads table in order to determine a match between the processlist and the threads. If we look at the table, you will find information about all the BACKGROUND threads in MySQL. While it’s great the performance schema can track the statements executed in the Slave SQL thread (I’ll discuss that later), it’s disappointing that the processlist_id, the one thing that can join our two sources of data other, has not value for the slave threads. What causes LOST_EVENTS error in the MySQL binary log? Using MySQL 5.6.13 under CentOS 6.4, I had a replication failure on one master/slave topology because the master binary log had the following entry that was intentionally written by the MySQL server. The question is why? I do not know the answer. Searching online indicates this can occur in a MySQL Cluster environment, and can occur around the use of GRANT statements. Neither of these situations are applicable here. This site runs 4 different master/slave topologies all running the same version, and this has been the only occurrence. The message, if taken literally could indicate that the master server failed to write all events to the master binary log, but instead of reporting any information (say in the MySQL error log), it basically tells you the binary log (aka the replication stream) is now incomplete and you need to rebuild your entire replication topology. If this is true, then this is a poor explanation, and there is no MySQL documentation I have found to shed light here. What appears to happen on the master, is the LOST_EVENTS binary log event is written, the binary logs are flushed, as indicated by the file sizes. Further analysis of the statements before the event in the master log show nothing of incident. Analysis of the binary logs at the error and subsequently how second timestamps that are identical, so there is no *obvious* loss of operations, but when there are 100s of transactions per second, using second granularity is ineffective. When confirming there were no events after this position on the slave, and the binary logs had been flushed the solution taken was to reset the slave to the next valid event. Last week I was a guest speaker at the second annual MySQL/NoSQL/Cloud Conference held in Buenos Aires, Argentina. Thanks to Santiago Lertora from Binlogic who has taken on the responsibility of organizing a event for the MySQL community in South America. My presentations slides for my 3 talks. While the MySQL community and ecosystem has changed dramatically over the past 5 years, one thing has remained the same. That is the friendships and relationships forged while working for MySQL Inc/AB as employees. No matter were you are in the world you can spend time talking about the past, present and future with alumni and have good time. Even here in South America there were many including Colin, Giuseppe, Monty, Rich, Gerardo, Vladim and myself. The “Too many connections” problem is a common issue with applications using excessive permissions (and those that grant said global permissions). MySQL will always grant a user with SUPER privileges access to a DB to investigate the problem with a SHOW PROCESSLIST and where you can check the limits. I however found the following. How can the max_used_connection exceed max_connections? This is possible because you can dynamically change max_connections in a normal MySQL environment. However ,this is AWS RDS where you cannot change variables dynamically via mysql client. You can via other command line options but this has not happened. Furthermore, this server is using the defauly.mysql.5.5 parameter group to further validate the claim that it has not been changed. I do not have an answer for the client in this case. I would also add this as another ding on the usability of RDS in production environments. I was locked out of the DB for a long time, and with no visibility of what was going on. The only options were wait, or restart the server. RDS does not provide this level of visibility of the processlist using a privileged user that could see what was going on. Perhaps an interface they should consider in future. I had to laugh (just a bit) at this on the exhibitor floor at Oracle Open World 2013. 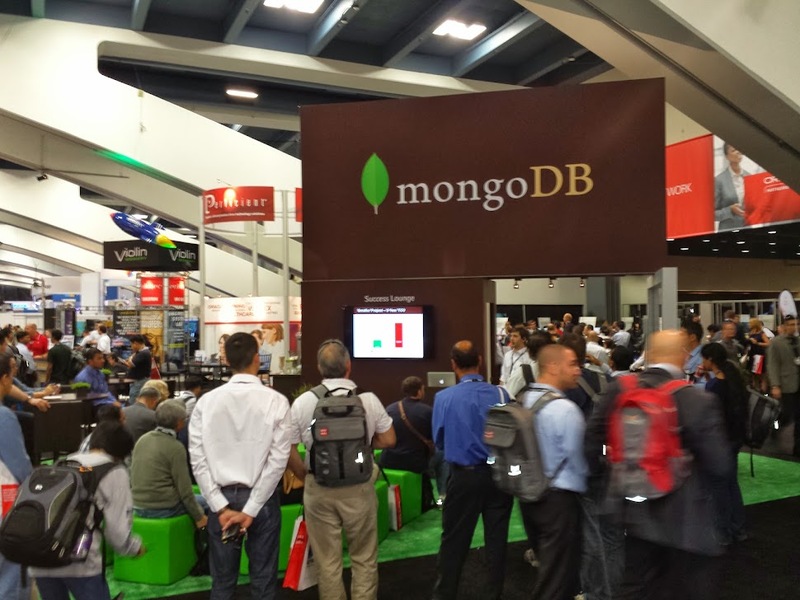 There was a large MongoDB presence at the Slot 301. There are a few reasons. First, the identity crisis remains. There is no MongoDB in the list of exhibitors, it’s 10gen, but where is the 10gen representation in the sign. 99.99% of attendees would not know this. 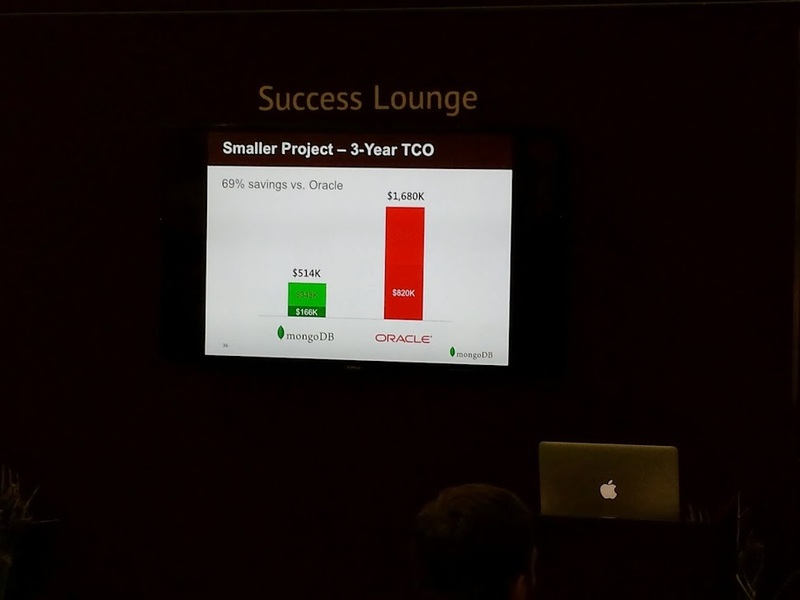 Second, the first and only slide I saw (as shown below), tries to directly compare implementing a solution to Oracle. The speaker made some comment but I really zoned out quickly. Having worked with MongoDB, even on one of my own projects, contemplated the ROI of being proficient in this for consulting, even discussing at length with the CEO and CTO, and hearing only issues with MongoDB with existing MySQL clients, I have come to the conclusion that MongoDB is a niche product. It’s great for a very particular situation, and absolutely not suitable for general use to replace a relational database (aka something with transactions to start with). A young and eager 10gen employee approached me, all excited to convince me of the savings. My first question to him was, how long have you been working at 10gen? After he responded 6 months, I informed him that I knew more about his product and specifically the ecosystem he was now in. Finally, it was rather sad to think that 10gen/MongoDB was not interested in exhibiting in the MySQL Connect conference, a competitor product in it’s space. They obviously feel that MySQL is dead, and no longer even a viable competitor in the market space. I have nothing personal against MongoDB, and it continues to mature as a product, however it’s a niche product with some strengths over a RDBMS in a minority of points. It definitely is not the right product for general OLTP applications.